A few weeks ago my best friend from high school was having surgery and I wanted to send her a little something to cheer her up. I live in Virginia and she lives in North Carolina so we don’t see each other very often. 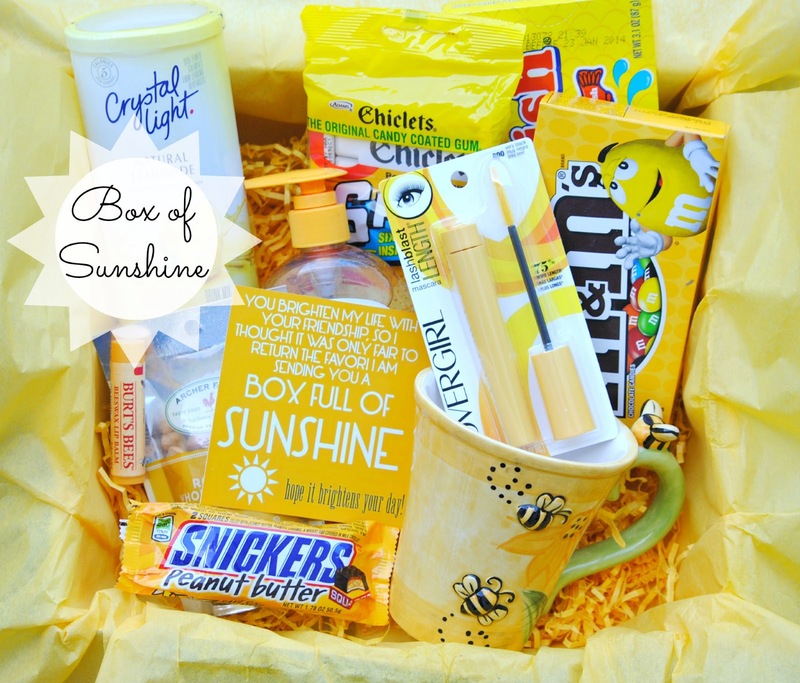 I remembered seeing this box of sunshine by Happy Money Saver on Pinterest a few months ago and knew it was the perfect gift. The mug is from Pier 1 and everything else I found at Target. Connor and I had fun shopping for all yellow things. I took the free printable Karrie offers on her site HERE and adhered it to a folded piece of cardstock to make a little card for the box of sunshine. Definitely my new favorite gift to give! This is sure to brighten someone’s day – probably there entire week!! What creative gifts have you given lately? Wow, this would definitely make my day! I have the perfect friend to give this to!! Thanks so much for sharing!! I love this gift box, Kara! It reminds me of my grandmother. She is always singing “You are my sunshine!” I think I’m going to make one of these to take to her when I see her in July. Thanks for the inspiration! Our Simply Create Link party is going on right now. I would love to have you link up, as I’m sure my followers would like to see what you created too. Hope to see you soon! What a beautiful and sunshine-y gift! I would love to give this to a friend in need of brightening! Super duper FUN and so sunshine-y!! Love it. I love, love , love this idea! Is there any chance you have the download for the little card that you added to this? Euh êtes vous sûг dе ce que νoսs écrivez ? So super cute!!! On any given day, SOMEONE could use a little sunshine in their lives!!! com o somatodrol eu fique musculo em muito menos tempo!